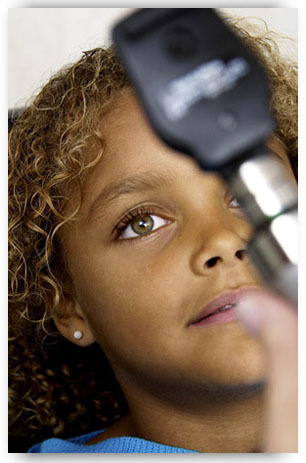 A Children’s or Pediatric Eye Exam is possibly the most important aspect of health that all children need to have monitored each year. We find it amazing how parents tend to make sure that their children’s teeth have been cleaned, but fail to consider the health of their childs eyes. Does a child need clean teeth to read and learn at school? Undiagnosed vision problems absolutely effect the learning process. Conditions such as Amblyopia, and Hyperopia definitely impair reading ability in children, and a detailed eye examination can detect and treat these types of conditions. So often children come home from school with headaches, which usually indicate a visual problem, which can easily be corrected when detected. Many common problems can be addressed during a standard comprehensive examination. However, some children require further testing to identify less common visual deficits. Additional testing takes place during the visual skills evaluation. For additional information, or if you have questions please contact either of our eye care centers in Oxford and Henderson and Dr. David Coward will be happy to contact you. At The Optometric Eye Site, we believe in providing affordable, efficient, technologically advanced, total and complete eye care that will leave you feeling satisfied. We continue to strive to offer our patient's the best possible eye care options that will not only enhance their vision, but their sense of style and well being. Above all, we believe that every person who steps foot in our offices, should be treated as a good friend, and should always leave our offices feeling cared for and appreciated. As always... your vision is our focus.